When Inspector CetinIkmen is invited to a murder mystery evening at one of Istanbul’s most exclusive hotels, he suddenly finds himself embroiled in a deadly game of life imitating art. Halfway through the evening, one of the actors is found actually dead in the room where Agatha Christie use to stay when she was in Istanbul. Walking in the steps of the great writer, Ikmen experiences fear and hatred which have echoes deep in his own and his country’s past. 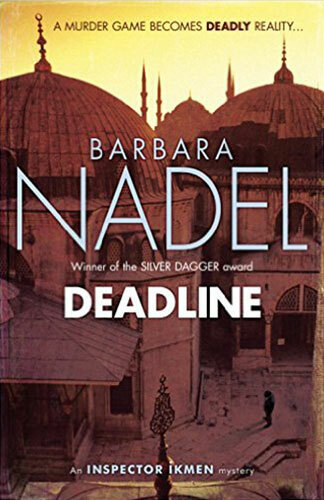 Barbara Nadel has been a prolific writer of crime fiction for many years and I’m ashamed to say that this is the first of her novels that I’ve read, however, it won’t be the last. I really enjoyed it. This novel, as with most of Nadel’s crime novels, is set in Turkey, in particular Istanbul. The main protagonist, Cetin Ikmen, is a middle-aged Istanbul detective and like many middle-aged detectives he can be a little grumpy and anti-social. He has it in his head that bad things always happen on his birthday, December 12th. So, when he is invited to a fund-raising event, at a very exclusive Pera Palas Hotel, on his birthday, he is very reluctant to go. However, he finally accepts the invitation offered by his good friend and pathologist Dr Arto Sarkissian, intending to stay a short time and then disappear. Arto’s brother, Dr Krikor Sarkissian, who is an addiction specialist, has organised the event. A theatre group, The Bowstrings, has been hired to put on a murder play with the founder of the group, Alp Ilhan, writing the script based on an Agatha Christie novel. Soner Erkan uses his parents money to keep the group going but he is a nasty piece of work and he makes sure that the group know that they only exist because of him and this is his power over the group. Lale Aktar, a popular female crime writer is one of the invited guests. Lale supports Krikor as she had once been poor and homeless until her husband, Faruk, came along. Agatha Christie was once a guest at the Pera Palas Hotel and the suite assigned to Lale is Agatha Christie’s favourite room. The guests have been divided into teams for the performance and Lale and Cetin find themselves on the same team. A murder occurs but it is not a performance it is real and the body is that of Soner Erkan. When Lale returned to her Agatha Christie room after dinner, the body of the young performer was on her bed. She ran back downstairs with her hands and dress covered in blood. Cetin and Arto immediately went to the room where they are ambushed by a gunman. While that is occurring upstairs, a group of armed people in disguise enters the hotel and holds the remaining guests hostage. Fortunately, one of Ikmen’s female colleagues was walking past the hotel and saw what was happening and alerted her superiors. Whilst outside the hotel, the police are deciding what to do, inside the hotel, the hostage takers have given Ikmen and his deputy, Inspector Suleyman and ultimatum, find out who killed Soner or everyone will die. They do not have access to phones or outside assistance, so it must be done by good old-fashioned detective work, examining the scene and interviewing witnesses, all under the gaze of their captors and with the clock ticking down. The twists and turns in this novel keep the reader interested from beginning to the end. Everything is not as it first appears. Who are the gunmen/women and what do they want? They don’t appear to be aligned to any particular religion, or political party and there are no demands apart from the demand to solve the murder. So what is behind all of this? There are quite a few surprises before it is all brought to a very interesting conclusion.